Today brings the fourth day of the tour for Not The Only Sky by Alyssa Warren. This is book with characters won't leave you long after you have finished reading. 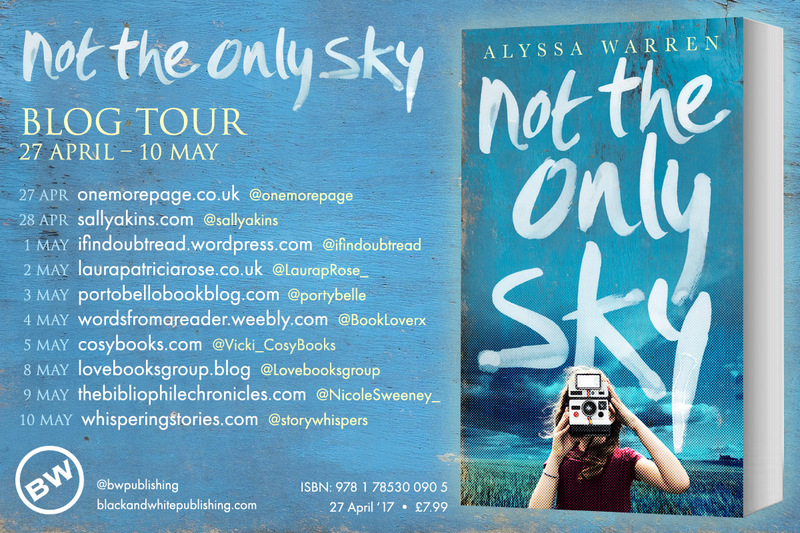 Read on for my full review of Not the Only Sky. Not the Only Sky is jammed packed full of eccentric characters that jumped off the page at you and once I had got used to their way of thinking, I fell in love with each and every one of them particular young Clea, known as Tiny Mite. Tiny Mite live with her twin Grandmothers Luvie and Bee and her Mum Velvet. Tiny Mite is always trying to get her Mother's love and affection, which is parts funny sad and savage. Velvet on the other hand is heartbroken and about to become more so. Fast forward six years later, Velvet has gone leaving Clea, who refuses to let anyone call her Tiny Mite, bitter and angry at the world. It's been a while since I read such a quirky read as this and it was actually so refreshing to read. This book felt so busy, there is so much hustle and bustle from the characters in not only what's going on with them and around them, but their thoughts too. Tiny Mite's thought bubbles were so cute, she literally is one of the most adorable characters and so witty and funny too! She has such an incredible imagination and is actually a very happy child making a camera out of a tuna can and box and drawing the 'photo's on pieces of paper. Honestly adorable. This is all set to change though as Velvet, Tiny Mite's Mum, doesn't want to stay in Big Bend anymore. She was meant for better things. One tragic day, it all gets a bit too much for Velvet and it sets the course for what Clea refers to as her 'rat heart'. It was quite a heartbreaking read and so sad how Velvet and Clea's Mother-Daughter relationship was so broken. Alyssa slowly leads up to what exactly happened that day and why Velvet has still not come back all these years later. Over a ten year span we get the see the impact on how quick decisions can make such an impact later on. I was hanging on for what I was really hoping to be a happyish ending and I think you will be satisfied with it, it suits the book. I am so happy to have discovered Alyssa Warren and hope to read more from her soon. Thank you Chloe :) and really do, it's one of those books that is so unlike anything else.